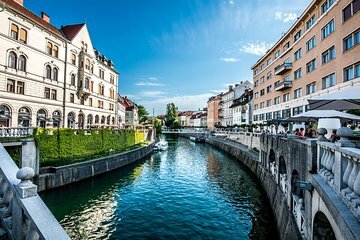 Del i historie og kultur i Sloveniens hovedstad på en guidet vandretur i Ljubljana historiske centrum. Du kan høre fascinerende fortællinger om Ljubljana mest berømte landemærker og monumenter og lære om byens bedst bevarede hemmeligheder fra din guide. Du vil også nyde et krydstogt ned ad floden Ljubljanica, hvilket gør denne tur til en fremragende værdi. This tour was okay, but I was hoping for more. The information was good, but there were several silences as the group travelled from designated place to place. I feel the bronze model of the city would have made an informative ending to the tour. Ljubljana is a gorgeous city so had high hopes to learn more during this tour. It started and ended strong with information about Robba and the sculptures and architecture of the city, but lost appeal when information became sparse as sites were pointed out with long silences between stops. Martin is one of the best guides I have ever had the pleasure of experiencing. He is highly knowledgeable and offers more than expected. Being quite professional, he was detailed, addressed all questions raised and made the tour very special. He is exceptional! The boat ride further enhanced the tour, as we saw Ljubljana from a different vantage point.